This article is from the February/March issue of the Comox Valley's wonderful community and lifestyle magazine, In Focus. Thank you to the magazine staff for your support! “The plants are the catalyst by which healing happens,” says Horticultural Therapist Lisa Hamilton. Nature heals. Deep in our bones, we know that to be true. But if you look at our incredibly sophisticated and complex health care system, you don’t see much nature. Instead, there are pills, machines, chemistry, scalpels, white coats and a pressing need to scrub away all traces of dirt. But there is a therapeutic field (no pun intended) that takes healing out of the clinics and hospitals and into the garden. A field where the healing properties of dirt are embraced. Known as Horticultural Therapy (HT), this little-known but widely-practiced treatment harnesses the power of the garden for healing. HT is used around the world to help a huge range of people—veterans dealing with Post-Traumatic Stress-Disorder, physically and mentally challenged children and adults, survivors of sexual abuse, the terminally ill, and people with brain injuries. Most gardeners will tell you that gardening is therapeutic—physically, emotionally, socially and spiritually. HT draws on this potential by having a trained Horticulture Therapist design and facilitate programs specifically around a client’s needs. HT activities encompass everything to do with the garden, from sowing to weeding and watering to harvesting and using the harvest in many different ways, as well as the simple power of just enjoying a garden’s beauty. “The plants are the catalyst by which healing happens,” says Courtenay resident Lisa Hamilton, a certified Horticultural Therapist. Hamilton recently graduated with an HT diploma from Vancouver Island University (VIU), which runs the only HT program in Canada west of Ontario. Hamilton has joined forces with Chanchal Cabrera, another Horticultural Therapist, Master Gardener, medical herbalist, and the founder of Gardens Without Borders (GWB), a new Comox Valley non-profit organization dedicated to promoting and providing Horticulture Therapy locally and, eventually, globally. These two women are a perfect fit. When Hamilton graduated last spring, she was faced with the challenging prospect of carving out a path as one of the first certified HTs in the Comox Valley. Cabrera was just in the early stages of founding Gardens Without Borders and needed support. It was a natural step for Hamilton to join GWB, helping with all aspects of founding and running a non-profit, as well as coming on board as a working Horticultural Therapist. For Cabrera, GWB is in many ways an evolution of the work and training she has done over the past 20 years. “I’ve been a medical herbalist all my working life,” says Cabrera. With a Masters in Science in Herbal Medicine, she works as a clinician, treating patients much as a Naturopath does, and also an educator, teaching herbal medicine at institutions and to the general public. She has also been an avid gardener her whole life and qualified as a Master Gardener in 1999. At that time the VIU program didn’t exist, but there was an excellent HT educational centre in the Cowichan Valley called Providence Farm. Cabrera, originally from Scotland and living in Vancouver since 1988, enrolled in their linking program for students who already have a relevant professional background. A one-month “extremely full-time” program qualified her as an HT. 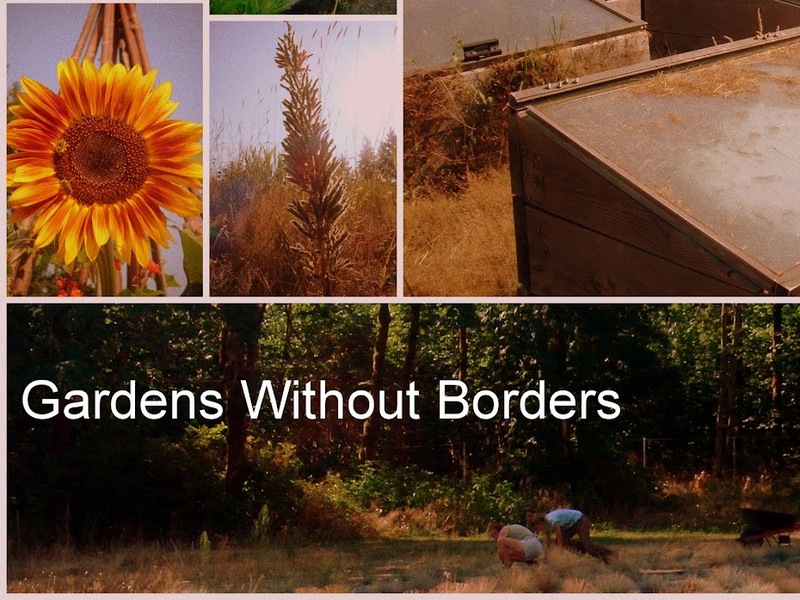 When the idea for Gardens Without Borders first came to Cabrera, the focus was international, but as it turned out the first step involved putting down roots in local soil. “I dreamed up Gardens Without Borders out of a sense of outrage, to be honest,” Cabrera explains. “I was reading about what was going on in Palestine. Here was a fourth generation born and raised and probably going to die in refugee camps. Olive groves destroyed, farms destroyed, people’s capacity to grow food and medicine destroyed. People’s roots literally torn up. It made my blood boil. “So my initial idea was to go to places where trauma has occurred and help set up gardens there to grow food and medicinal plants. But it became apparent really quickly that there was a need right here, and I thought I should learn more before landing in a foreign country and just being a nuisance,” says Cabrera. 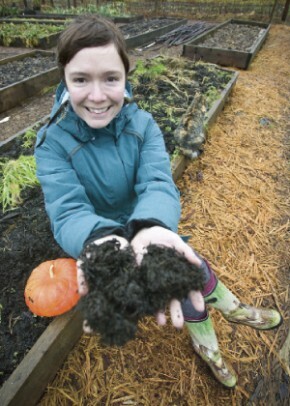 About five years ago Cabrera and her husband bought land in Royston and founded Innisfree Farms as a multi-purpose agricultural centre, growing and marketing produce and medicinal plants, running courses, hosting the Comox Valley Seed Savers, and providing a home base for Gardens Without Borders. The garden at Innisfree is designed specifically for therapeutic purposes. There are raised beds which are accessible to people with impaired mobility. For people with vision limitations, there are many tactile and scented plants and a water feature so they can hear where they are to help stay oriented. Also, the garden is contained, which provides a feeling of safety and also ensures that clients can’t wander off across the fields. GWB started offering Horticulture Therapy at Innisfree about a year ago. Programs are custom-designed. Hamilton conducts a thorough initial consultation with clients and, if appropriate, their caregivers, assessing needs, limitations and goals. She then designs activities for each session. Hamilton says that HT involves less actual gardening than most people imagine. Success is not measured in rows planted, weeded or harvested, but rather by improvements to the client’s well-being. Clients range greatly in their abilities and needs and the HT’s job is to find a balance between what clients can do, what they want to do, and what will be most therapeutic. “The program is very flexible and ultimately depends on the weather and how the client is doing on that day,” Hamilton says. “It could just be walking in the garden. It could be creating a tea-cup garden that they can take home or give to someone, or a craft such as making pressed flower cards. 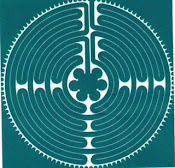 It could be photographing the flowers, feeding the chickens, or walking the labyrinth. On the other hand, there are plenty of instances where HT involves full-on gardening and farming activities. Sessions at the farm include lunch, which the clients help prepare and serve. This adds a social element and provides opportunities to learn cooperation, communication and planning. Because GWB is a non-profit society, it keeps its fees very low—just $15 for a three-hour session including lunch. Clients have a variety of funding sources and Hamilton is trained to make formal reports on the HT sessions for funding authorities when needed. As well, GWB offers group programs, such as a recent afternoon session with women from the Comox Valley Transition Society. There are countless ways that gardens can be therapeutic. “Physical agility and dexterity happen. People learn skills that could help them get a job, so there’s a vocational training element. And there’s also a huge emotional and spiritual healing,” says Cabrera. There’s plenty of research proving that access to nature is therapeutic. “And there was an article in [British journal] The Lancet looking at what factors influence health in inner city populations,” says Cabrera. “The single most important criterion was access to green space. It trumped income and education. Science is just confirming what writers and artists have been telling us for centuries. From Van Gogh’s radiant sunflowers to the children’s classic, The Secret Garden, where a broken family is healed through the magic of a garden, our culture has always reflected on nature’s healing powers. In fact, Horticulture Therapy has been around in various forms since long ago; it just wasn’t given that name. In Ancient Egypt, physicians prescribed “walks in the garden” to aid in the recovery of their patients. In Europe and America, throughout the 1700s and 1800s, it was a common practice to have people with mental health challenges work at farms and gardens to treat their symptoms. In the 20th Century, after WWI, therapy gardens were founded across the United States at veterans’ hospitals to help returning soldiers heal their physical and emotional wounds. Today, you can find therapy gardens at prisons, psychiatric hospitals, schools, and residential care facilities. It’s hard to pin down the exact moment HT was launched as a formal discipline. Some would say it was in 1955, when Michigan State University created its first Masters of Science degree in HT. In 1973, the American Horticulture Therapy Association was founded, and in 1987 its Canadian counterpart came into being. HT is also widespread throughout Europe, especially Germany and England. No one has an exact count of Horticultural Therapists, but the Canadian Horticultural Therapy Association has 175 members. The discipline has strong roots in BC, thanks largely to Providence Farm, which has been offering HT programs since 1979. It was the founder of this program, Christine Pollard, who launched the VIU program Hamilton attended. To become a certified HT, Hamilton attended the university full-time for two years, combining horticultural studies and education in community support work. Training ranged from the technical, such as how to design and build gardens that are accessible for people with disabilities, to interpersonal, such as how to develop an effective therapeutic relationship. Although she has many of the skills of a traditional therapist, Hamilton sees her role as more of a facilitator. “I don’t try to steer the clients to any sort of rehabilitative solution; the clients themselves hold the key to their own healing.” Ultimately, she says, it is the relationship with the plants that brings healing. “Being with plants speaks to something non-verbal in us. People who’ve been traumatized often find a very deep sense of peace from sitting in a garden, walking in the woods, or digging,” says Cabrera. Although HT focuses on bringing healing to specific people, there is a wider relevance to the whole endeavour. As our world becomes ever more mechanized and our reality ever more virtual, our need to reconnect with nature grows more and more urgent. You could argue that human society itself needs some Horticultural Therapy. In fact, Cabrera points out, Nature Deficit Disorder is increasingly recognized as a problem affecting our health as individuals and communities. Richard Louv, who popularized this term in his book, Last Child in the Woods, links the lack of nature in the lives of today’s wired generation to disturbing childhood trends, such as the rise in obesity, attention disorders, and depression. His book has helped galvanize a “no child left inside” movement aimed at getting kids back outside. Louv emphasizes that Nature Deficit Disorder is not an individual affliction but rather a social disorder. We can see society’s desire to reconnect with nature expressed in everything from the rising popularity of farmer’s markets to the hit film Avatar. In a society afflicted by Nature Deficit Disorder, the garden increasingly seems like the perfect setting for healing. Clearly, the time is right for Horticultural Therapy and for Gardens Without Borders. “People are so hungry for a relationship with plants,” says Cabrera.